Theme: "We are the wordsmiths, the music makers, and we are the dreamers of dreams." - Roald Dahl. Applicants may submit their original poetry in any style, from formal verse, to free verse to experimental. The poem should be formatted as you wish it to appear in publication. Winners in the poetry category may be invited to participate in a public reading of their works. Applicants may submit visual are and photography-painting, ceramics, glass, sculpture, mixed media, printmaking, weaving and photography. These must be submitted either as digital files which must be a minimum 300 dpi JPEG or submitted in person. All work must be the applicant's original work. 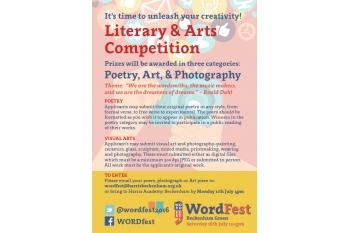 Please email your poem, photograph or art piece to wordfest@harrisbeckenham.org.uk or bring to Harris Academy Beckenham by Monday 11th July 4pm.